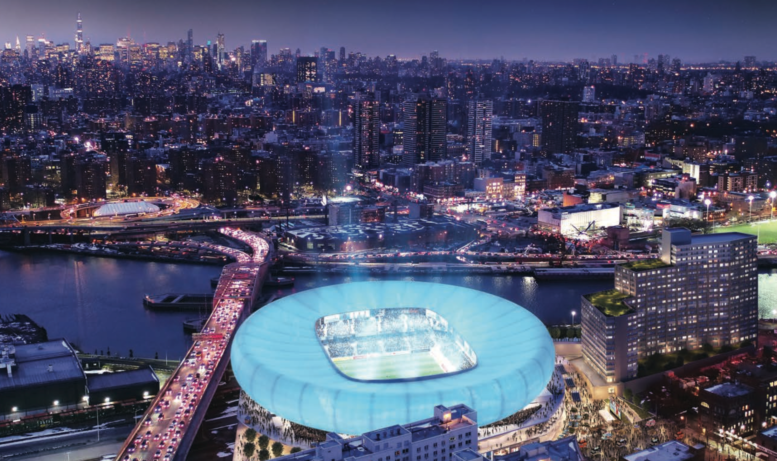 Rafael Viñoly Architects is set to design New York City's first soccer stadium. Related is spearheading the 26,000-seat Bronx project, which will be the future home of the New York City Football Club. Similar to Hudson Yards, Related's mega-development on Manhattan's Far West Side, the stadium will be constructed over rail yards by the Harlem River in the South Bronx. While a deal for the site hasn't been finalized, YIMBY got its hands on the preliminary renderings for the RFP, which Related submitted with Somerset Partners. Somerset Partners is working on a major project on an adjacent lot, a development with nearly 1,300 units of market-rate housing along 1,200 feet of the river. Given soccer's popularity in the five boroughs, it's surprising that the Bronx stadium will be the city's first. The renderings right now make the toilet seat–shaped arena look more like a massing diagram than anything, but the design is sure to evolve if the city accepts the developers' proposal. The Architect's Newspaper (AN) reached out to Viñoly's firm and Related for comment, and both declined to share any more details on the project. The stadium will be joined by affordable housing in a project the developers are calling Harlem River Yards. The New York City Football Club's new home and the 550 units of housing will be joined by a medical facility, retail, and an 85,000-square-foot park. Related and Somerset would lease the 12.8 acre property for $500,000 annually for 99 years, and invest $125 million total in sitework and a planned waterfront park. Harlem River Yards is expected to cost $700 million in total, and it's slated for completion by 2022. The first rendering for a Rafael Viñoly Architects-designed residential tower at 249 East 62nd Street in Manhattan has been unveiled, and it looks like the building will feature rings of upper-floor condo units arranged around an octagonal core for maximum views. While the rendering of 249 East 62nd Street recently surfaced on the website of the Hudson Meridian Construction Group, the contractors responsible for building the tower, the building’s odd massing had been making the rounds after the Department of Building’s original approval in September of last year. At 510 feet tall and only 32 stories, Viñoly’s tower will telescope upwards in the middle, resulting in two disparate sets of upper and lower living areas. By shunting the mechanical spaces to the 13th through 16th floors and boosting the upper half of the building, the top floors will be able to see well over their neighbors and into Central Park, as well as across the East River. Grey concrete columns will run from the building’s base to the roof along the angled edges of the eight-sided superstructure. The building’s base will contain a townhouse and 2,588 square feet of retail, while residential units will rise until the 12th floor. After the extending “stem” portion, floors 17 through 29 will contain three units each, and it’s expected that the prices of each will rise in tandem. At 98,526 square feet of residential space, the more expensive units at the top will average well over 1,200 square feet each, andwith 83 apartments listed for the building in total, the remaining units in the bottom half will likely be more densely packed. The compression is likely the result of Viñoly trying to design around New York’s zoning codes; in this instance, 55 percent of the floor area must be located below 150 feet. Developers Real Estate Inverlad and Third Palm Capital are funding the tower. While no completion date has been announced, construction permits were issued at the end of 2017, so work should be starting shortly. 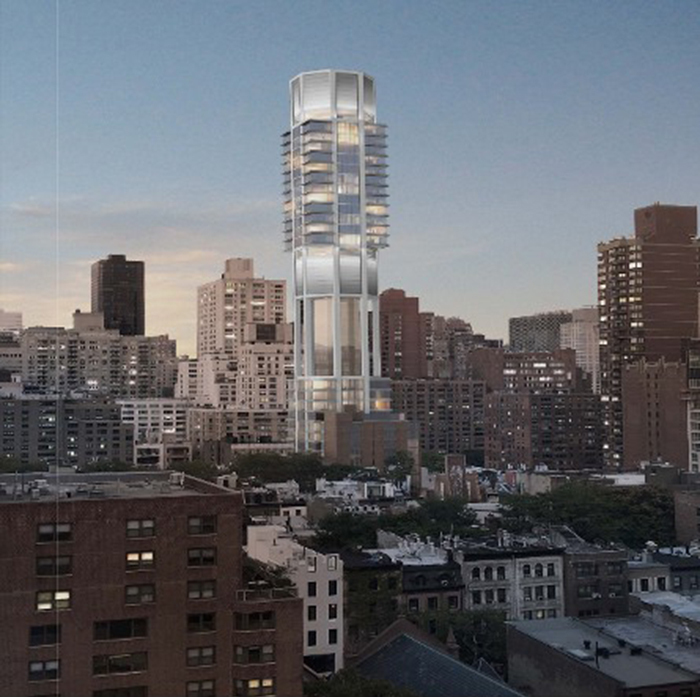 It didn't take long, but Rafael Viñoly has a new Manhattan tower. 125 Greenwich Street isn't as tall as 432 Park Avenue, a sleek supertall that looms over its neighborhood like the first kid in the class to hit puberty. But Viñoly's FiDi skyscraper is still plenty stringy: Rising 88 stories, the 912-foot-tall glass-shrouded tower just south of the World Trade Center will house luxury condos with interiors by March & White, a British firm that built its reputation designing superyachts. Perhaps because Greenwich Street is so close to the Hudson River, or maybe because rich people like fancy boats, the interiors of the 273 units are inspired by the same leisure vessels that gave March & White its start. The building's top three floors are devoted to nice things like a spa, a 50-foot lap pool, and a fitness center, complete with a yoga studio and training room. And what's a tall land-yacht without a place to entertain? Residents will have access to a private dining room, events space, and screening room. Dual exposed concrete columns with a zipper of windows run the length of the wasp-waisted tower, creating almost column-less floorplates, while the curved glass curtain walls should offer sweet views on the diagonal. While the renderings show off plenty of height, there are no images of the ground condition, leaving questions unanswered about the building's relationship with the street. 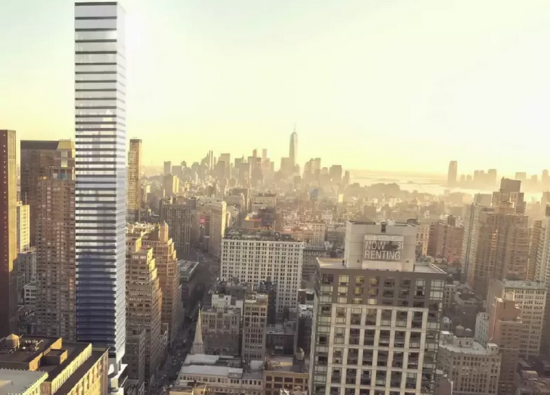 Here's what Viñoly had to say about the design: "125 Greenwich Street takes an unconventional approach to current residential tower design in New York City. The landmark tower's structure is essentially two giant upended I-beams that facilitate a nearly column-free interior for highly flexible residential configurations. A curtain wall system with rounded corners that efficiently mitigate wind pressure—and take full advantage of the panoramic views—completes an elegant structural solution. Two I-beams have never been more productive." Although the tower was announced back in 2014, the new renderings accompanied the building's sales launch today. Prices start at $1.2 million for a studio, with prices for three bedrooms (the largest apartments) starting at a little over $4.6 million. New York-based designer Kelly Behun has completed a half-floor penthouse at Rafael Vinoly’s 432 Park Avenue. 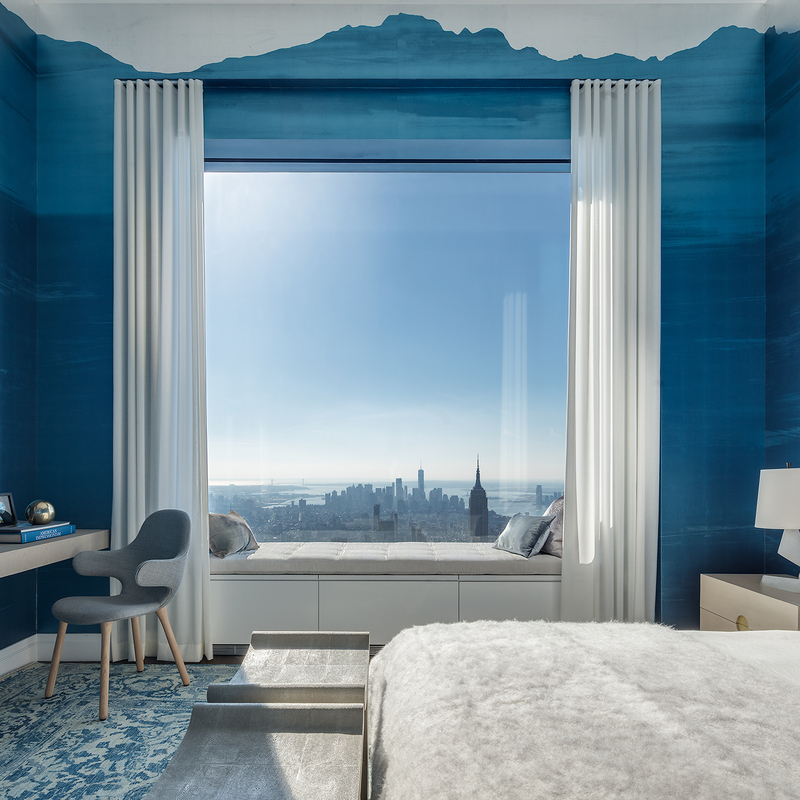 Co-developed by CIM Group and Macklowe Properties, the 3,977-square-foot model penthouse is located on the 92nd floor of the 96-story, 1,396-foot-tall residential building, which is the tallest residential tower in the Western Hemisphere. Priced at $39.75 million, the penthouse sits at 1,224 feet in elevation and faces south with views of nearly every New York City landmark including the Empire State Building, Chrysler Building, Central Park, Statue of Liberty, Brooklyn Bridge, Lower Manhattan skyline, and New York Harbor out to the Atlantic Ocean. Asymmetrical design pieces respond to the building’s signature 10-foot by 10-foot square windows and iconic white grid. “My goal was to create a timelessly elegant space that feels warm and comfortable. My favorite aspect of the apartment has to be the views through those oversize windows,” said Behun. “To have all of Manhattan unfurl below you in this way is nothing short of extraordinary, and nothing I would do inside could ever upstage that, so I just sought to create a warm embrace from which to enjoy it.” The penthouse has three bedrooms, three bathrooms, a powder room, library, gas and wood-burning fireplace, laundry room, service entrance separate from the elevator landing, and formal entrance gallery. Love it or not, Rafael Viñoly's 432 Park makes a statement on the New York City skyline. The 88-story, 1,396-foot-tall skyscraper will be home to some of the world's richest people (and/or their faceless LLCs). One soon-to-be-resident is bringing the public's prying eyes inward by bucking the less-is-more aesthetic of contemporary interior design for a maximalist, marble-on-marble pad designed by Brooklyn–based Atelier & Co. Atelier & Co. went for baroque with the design of a 4,000-square-foot residence on the tower's 40th floor. The building's structural tube design allows for open, no-column layouts, allowing residents to configure the space freely from a standard skyscraper layout. Atelier & Co.'s plan removes the sitting room to create a combined dining and living area, divided only by a bookcase lifted from the set of Downton Abbey. Meanwhile, the size of the master bathroom is doubled, presumably to accommodate the owner's collection of marble busts, vases, or anachronistic glass globes. 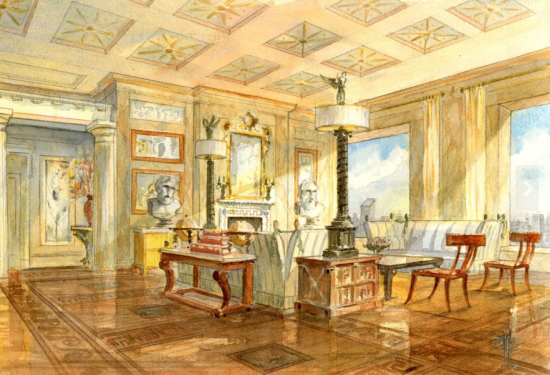 The colonnaded entryways, ornate wood floors, and coffered ceilings do right by Joan Rivers and Louis XIV. Atelier & Co. notes that the design was influenced by 19th century Prussian architect and painter Karl Friedrich Schinkel as well as Leo von Klenze, the German painter, writer, and architect. The designers do recognize that their creation is inside a supertall, not Versaillies. They claim that the aesthetic draws on Viñoly's geometry, perhaps in the patterning of the living room's coffered ceiling. As this monumental throwback interior takes shape, it's a good time to note that the Council on Tall Buildings and Urban Habitat, the organization in charge of keeping tabs on the world's supertalls, recently recognized 432 Park as the world's 100th supertall. The tower clocks in as the second tallest building completed in 2015, per the organization's numbers. While living in this apartment may cause irreparable damage to your taste, that's not the only danger it poses. A recent study in the Canadian Medical Association Journal suggests that living on a building's upper floors increases the risk of dying from cardiac arrest. Citibank announced on Friday that it will donate $10 million t0 the Hudson River Park Trust (HRPT) for the renovation of Tribeca's Pier 26. For Citi, it's a sweet quid pro quo: the river pier is adjacent to Citi's soon-to-be global headquarters at 388–390 Greenwich Street. Philadelphia-based OLIN will lead the park's design team. 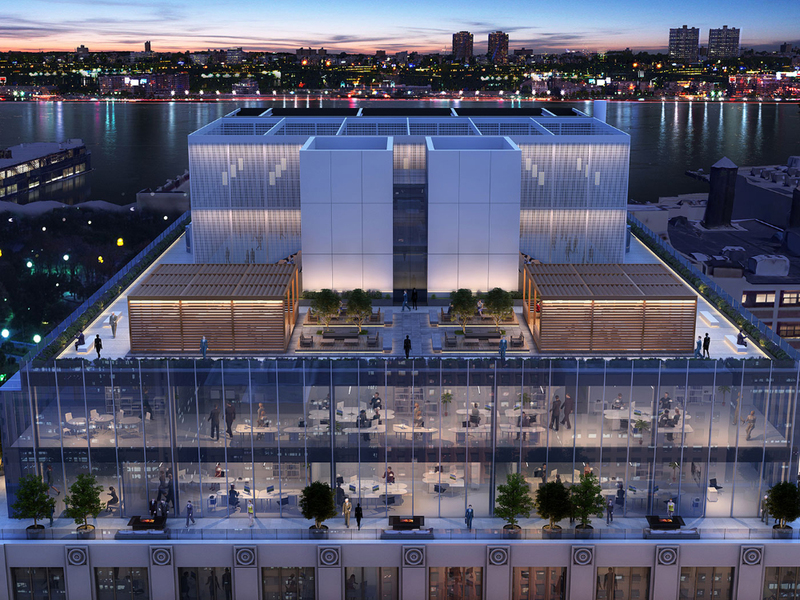 Rafael Viñoly will work pro bono to design a research and science education center for the site. Pier 26 will expand programming for Hudson River Park's 17 million annual visitors. In 2008 and 2009, the Lower Manhattan Development Corporation used HUD funds to rebuild the pier to support future development. When current construction is complete, pier will host the science center, free kayaking, and City Winery's sister restaurant, WXY-designed City Vineyard, opening in 2016. HRPT is also getting $10 million from the city for the project, and is applying to the Lower Manhattan Development Corporation for additional support. Construction and completion dates have yet to be finalized. 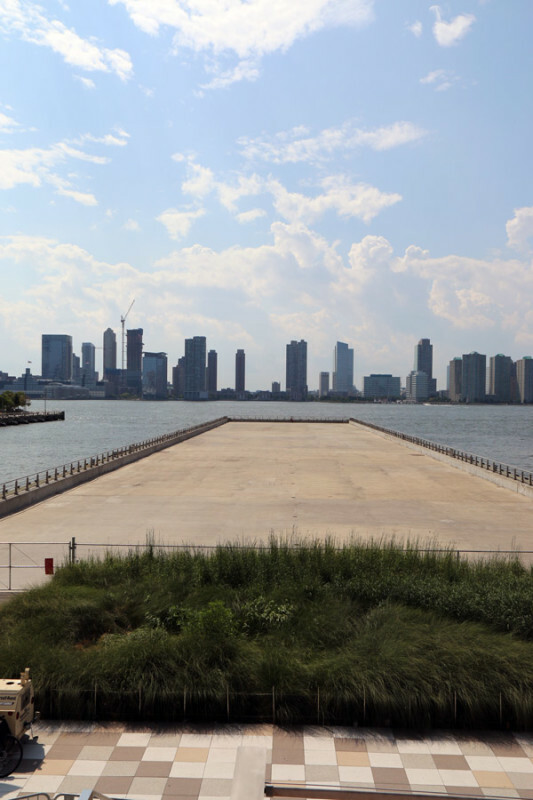 New Yorkers will be able to weigh in on "ideas for uses and programming at the new pier" at Community Board 1's meeting on October 19. 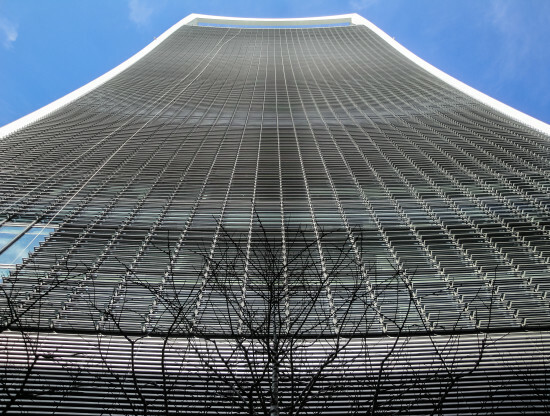 After roasting cars and carpets, London's 20 Fenchurch Street, nicknamed the Walkie-Talkie Tower, has itself been roasted as the winner of the Carbuncle Cup, British architecture's least desirable award. Building Design magazine, which organizes the award, described the tower as a “gratuitous glass gargoyle.” The structure, designed by Rafael Viñoly, has struggled for any form of critical acclaim since it opened in 2010. “It is a challenge finding anyone who has something positive to say about this building,” said BD editor Thomas Lane. The Guardian's architecture critic, Oliver Wainwright, was just as unforgiving when he likened the structure to a "sanitary towel." Londoners have claimed that the Walkie-Talkie, nicknamed for its visual resemblance to the handheld communication device, has blown them away—and into the street. 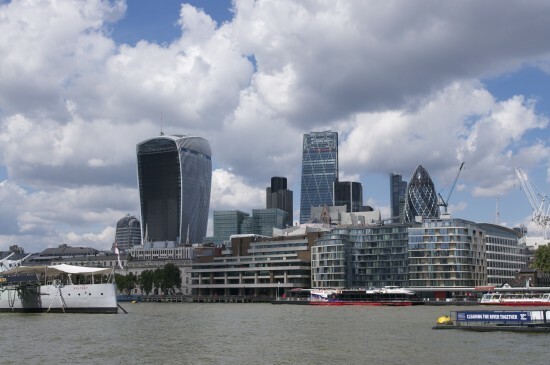 Twenty Fenchurch Street's embarrassing wind problem has prompted the City of London to look at "changing the way it works with developers." Knocking people off their feet isn't the only accusation lobbed at Viñoly's design. In what is becoming a growing list of misdemeanors, developers of 20 Fenchurch Street have had to pay £946 ($1,500) in compensation after the tower burnt a Jaguar and a hole into a shop carpet. A screen has been built to halt the reflective death-ray. In its turbulent start to London life, the building's reflective power has been harnessed by the locals, as one resident was able to fry an egg with the building's glare. That led to another nickname, the "fryscraper." "When I once described Rafael Viñoly as a menace to London," tweeted ex-RIBA president George Ferguson, "I didn't think he was going to burn it." The architect's proposal has prompted equally vicious responses during its planning stages. UNESCO voiced its distaste for the design and English Heritage bestowed it as a "brutally dominant expression of commercial floor space" with an "oppressive and overwhelming form." Peter Wynne Rees, chief planner of the City of London, has since admitted he made a mistake for the building's location, saying that he was persuaded by the project's public element, a 525-foot-high garden. Even this signature feature has been the subject of scourge. Wainwright, who is clearly not the building's biggest fan, wrote in the Guardian that it "feels like you’re trapped in an airport, you can barely see the city because of a steel cage – and the more money you shell out, the worse it gets." Twenty Fenchurch Street's issues with sun glare are nothing new to modern architecture however. In Las Vegas, the Vdara Hotel startled Bill Pintas, a Chicago lawyer and businessman, when he started to smell his hair burning. "I actually thought that, Oh my God, we've destroyed the ozone layer because I am being burned," Pintas told NBC's TODAY show back in 2010. "My head was steaming hot... I could actually smell my hair burning." In Dallas, too, the Museum Tower by Scott Johnson has been subject to criticism as it fried artwork at its neighbor, the Nasher Sculpture Center. And of course, Gehry's Disney Concert Hall in Los Angeles, drew international attention for sizzling surrounding buildings and blinding drivers. Blustery conditions from skyscrapers are also no new problem. New York City's Flatiron Building caused an "ankle-revealing sensation" in the early 20th century with winds it sent rushing to the sidewalk. In 1983, engineering consultant Lev Zetlin asked for laws to halt the wind-tunnel-effect termed "downdraught" in New York. Green roofs these days are the new blacktops. 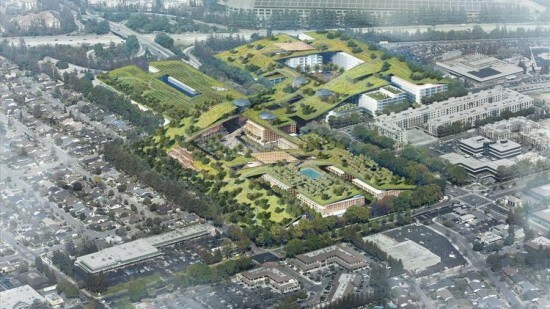 And just when you thought they couldn't get any bigger, there are now plans to build a 30-acre park blanketing a mixed-use, $3 billion development in Cupertino, California. Right now, the site is the dying Vallco Shopping Mall. Developers Sand Hill Property bought the mall last year and hired Rafael Viñoly and Olin Landscape Architects to redevelop the 50 acre site. "[Sand Hill] didn’t quite know what they would get when Viñoly traveled to their offices in Menlo Park last April for a first-round presentation," wrote the Silicon Valley Business Journal. "While other architects came armed with reams of site plans and renderings, Viñoly had a suitcase. In it was a model of his concept, which he assembled piece by piece, topping it off with the roof park." Renderings show a rolling lush carpet of green capping a 15-block grid of buildings below. But that green is not just a lawn. The rooftop park will feature quite an unusual mix of amenities: a vineyard, close to four miles of trails, an orchard, a playground, as well as lots of oak trees. Plans also include 800 apartments and over 250,000 square feet of retail. There are multiple plazas, a market hall, 2 million square feet of offices, and parking mostly below ground. The highest point in the development would top out at seven stories. "To secure the community buy-in, the developer is going all-out, promising to contribute more than $40 million to build a new K-5 elementary school, replace portable classrooms and provide an “innovation center” to the Fremont Union High School District, among other goodies," reported the SVBJ. If conservatives bristle at building a bridge over a UNESCO World Heritage Site, just make it circular. 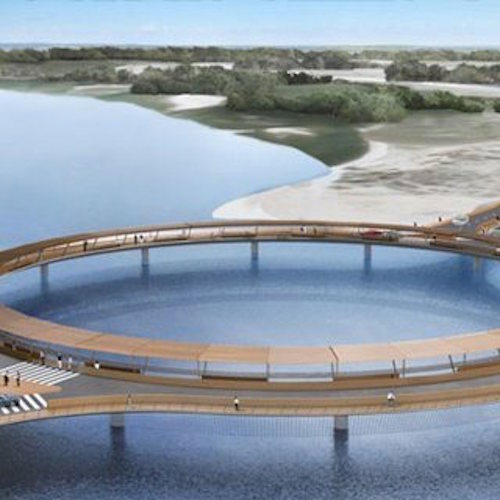 This ring-shaped bridge by architect Rafael Viñoly will superimpose the Laguna Garzon, its circular design meant to minimize its environmental and visual impact by recalling a winding road—plus the fact that it uniquely affords veritable 360-degree views. [Video courtesy Teledoce.] The final cost of the project is $11 million, with the state providing $1.8 million. Argentinian real estate developer Eduardo Costantini, owner of high-end guesthouses Las Garzas in Rocha, will foot the remaining bill. The Uruguayan Ministry of Transport has eyeballed the prospect of a bridge over the lagoon since 1950, but the project did not start until May 2013. Slated to connect the cities of Maldonado and Rocha when it opens in November, the bridge has the potential to mediate the flow of travelers and tourism dollars up and down the eastern seaboard. It will replace the current system of rafts that connect the two cities, which allows only two cars to pass at time, depriving Rocha of the development frenzy seen in Maldonado. Statistics indicate generally favorable views of the project, with 81 percent of Rocha residents and 64 percent of Maldona residents who spoke positively about the bridge. Government estimates indicate that 1,000 vehicles will traverse the bridge daily, with an increase in those numbers during the peak summer months. Scheduled to open in November, the bridge is well under construction. View the video above from Teledoce to see how it works. Rafael Viñoly's latest Manhattan luxury tower almost seems quaint next to his 1,396-foot-tall, trashcan-inspired 432 Park Avenue. NY YIMBY has published renderings of the architect's 281 Fifth Avenue in NoMad, which is only about half the size of his Park Avenue behemoth. To be clear, this does not mean the new tower is short—it weighs in at 705 feet tall—but it does reinforce that 432 Park Avenue is really, really tall. As for its design? On its most basic level,281 Fifth Avenue's limited renderings released so far show a glassy box—a lot like other recent New York City skyscrapers. The tower sets itself apart with a series of horizontal spandrel bands between rows of ribbon windows that increase the amount of glass as it ascends—much like a slinky being pulled up from the ground. According to permits filed with the New York City Department of Buildings, the building contains 141 condominiums and nearly 8,000 square feet of retail on the first and second floor. Demolition is currently underway at the site, and the building is slated to be completed in 2018.